Dry chicken breast thoroughly with a paper towel. Rub with 1½ teaspoons of oil, season with salt and pepper. Grill until fully cooked. Refrigerate until chilled, about 10-15 minutes. Cut grilled chicken into small cubes. In a medium bowl, combine remaining 3 teaspoons olive oil, green onions, eggs, lemon zest, chia seeds, mustard, mayonnaise, cranberries and blueberries. Stir until combined, then fold in chicken. 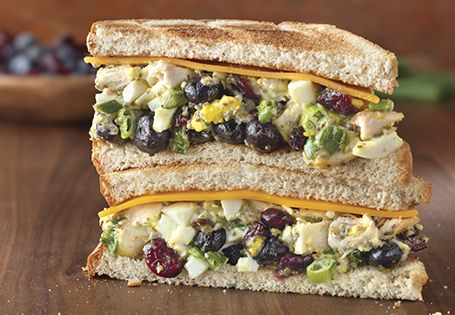 Scoop 1/4 cup of chicken salad onto toasted bread slice. Top with cheese and another slice of toast, serve immediately.